The eminent English poet Shelley once said in his Ode to the West Wind "If winter comes, can spring be far behind?" Winter is a season of hope and reborn. It cultivates everything in her land and welcomes the new world with full enthusiasm and vitality. Riding a stylish Fosjoas two wheel self balancing scooter V9 in the winter will definitely bring much vigor and color for the monotonous and somber feeling. In the winter, the generic color is pale and plain so it emits a feeling of boredom and monotony. 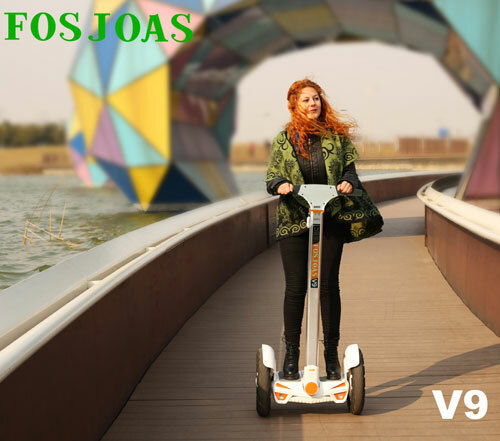 However, the bright color of Fosjoas electric scooter V9 catches people's eye at first sight and lifts their mood even on Black Monday. Happiness and refreshment wipe out all the tiredness and stress and give a feeling of reborn. For the vehicle, orange, silver and black colors are matched in an appealing way with elegant figure and marvelous details. Besides of appearance, the vehicle employs state-of-the-art protection techniques and high-quality materials. The built-in intelligent system enables the rider to control Fosjoas electric scooter V9 instantaneously and accurately. Self-balance of the vehicle can be achieved with the application of fuzzy algorithm, aviation attitude control technique and gyroscope system. This unique riding experience liberates the feet and hands and takes the rider to another world with excitement and joyfulness, bringing fresh breeze to the dull and depressing day. In addition, all the raw materials are selected in a strict way to keep the best quality. The imported Japan-made lithium-ion battery core is used in the vehicle with the lifetime 3.8 times than that of an ordinary one. All the batteries have gained quality testing certificates to safeguard the security of the rider. Besides, the full-charging of the vehicle is quite efficient which only takes only 180 minutes with 520Wh. In addition, the aluminum alloy frame of Fosjoas V9 boasts homogeneity in every place which looks glossy and feels smooth. The winter is already coming. Let Fosjoas self-balancing two wheel electric scooter V9 shine the world and enjoy the heartfelt happiness!